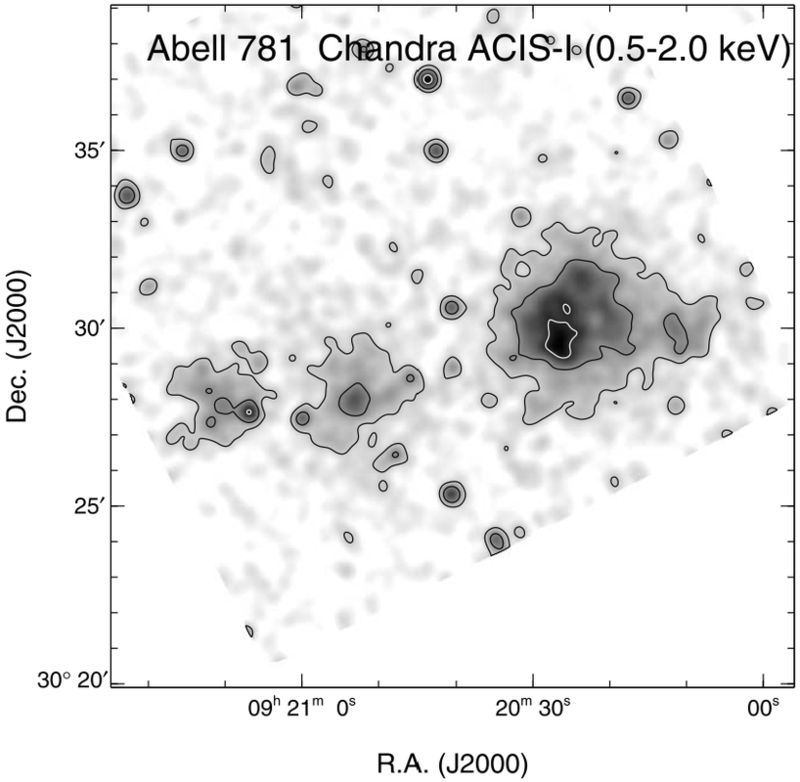 Abell 781 is a well studied system, that is actually composed of multiple clusters at two different redshifts (0.3 and 0.45). After being cataloged by Abell et al. (1989), Jeltema et al. (2005) studied it as part of Chandra archival cluster survey. They briefly noted that it is a complex cluster with multiple peaks. Wittman et al. 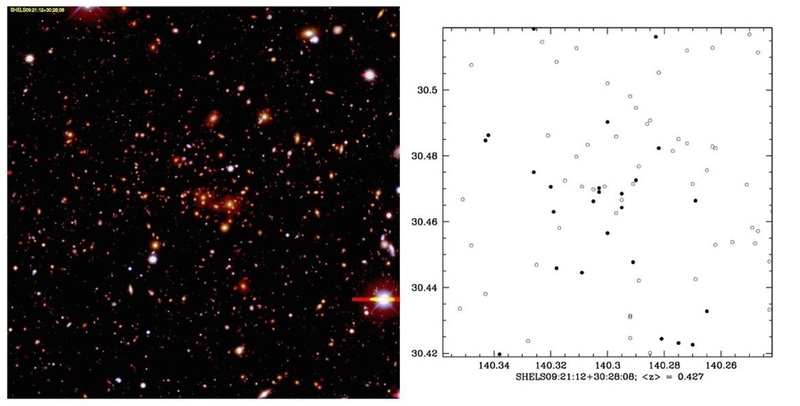 (2006) obtained deep (R~27) multi-band optical imaging of the A781, since it is in Field 2 of the Deep Lens Survey (DLS). 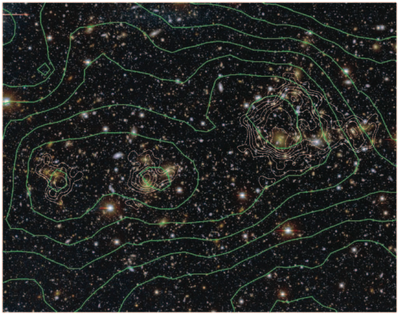 They used this imaging to map the mass of the system via a weak lensing analysis. The mass map showed good agreement with the Chandra X-ray map. Although the western most subcluster was not discussed (since it fell outside the Chandra footprint), and the weak lensing mass map did not have the resolution to deblend the Subcluster from the Main cluster. There have been multiple mass estimate analyses performed on A781 including weak lensing, X-ray, and galaxy velocity dispersion (see Wittman et al. 2013 and references therein). In an overlapping spectroscopic survey of DLS Field 2(Wittman et al. (2006), Geller et al. 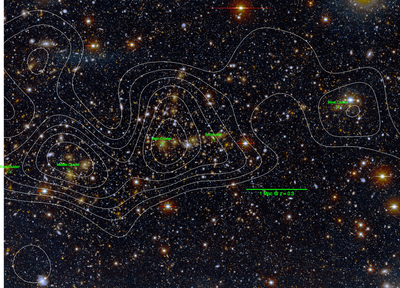 (2005) found that the Main and Middle clusters were at redshifts of 0.302 and 0.291, respectively. However, they found that the East cluster is at a redshift of 0.4265. In a later study Geller et al. (2010) also measured the redshift of the West cluster to be 0.4273. Confirming that A781 is actually consists of at least four clusters at two different redshifts. 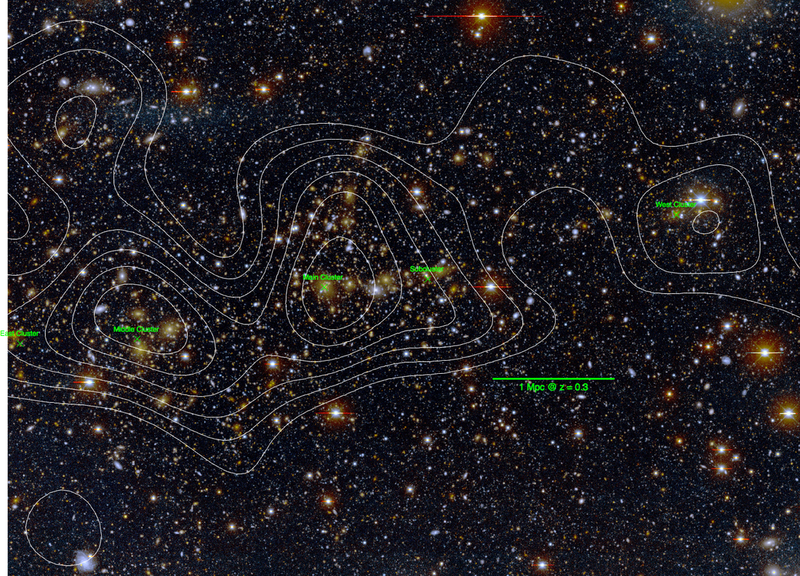 In total they have obtained ~410 spectroscopic redshifts of the A781 system. While not specifically isolated in their analysis the Subcluster appears to be at the same redshift as the Main cluster, see Figure 13 of Geller et al. (2010). Sehgal et al. 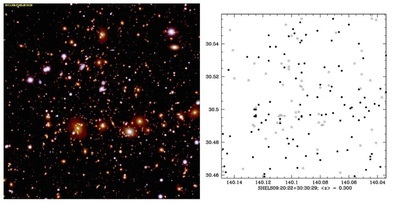 (2008) conducted two detailed X-ray analyses of the system using Chandra and XMM data, with their focus being on comparing X-ray and weak lensing mass estimates. They confirmed the previously reported Main, Subcluster, Middle, and East clusters (Geller et al. 2005, Wittman et al. 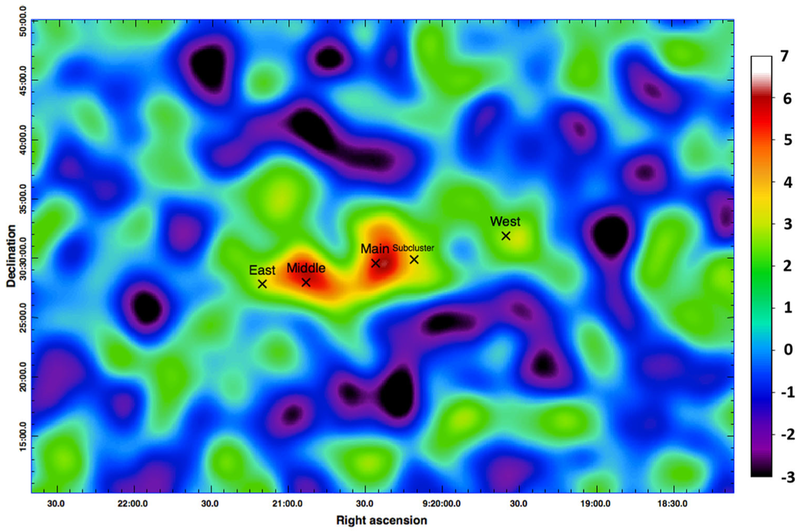 2006), as well as identified a new West cluster in the larger field-of-view XMM image. Venturi et al. (2008) were the first to carry out a detailed radio study of Abell 781 as part of their GMRT radio survey. 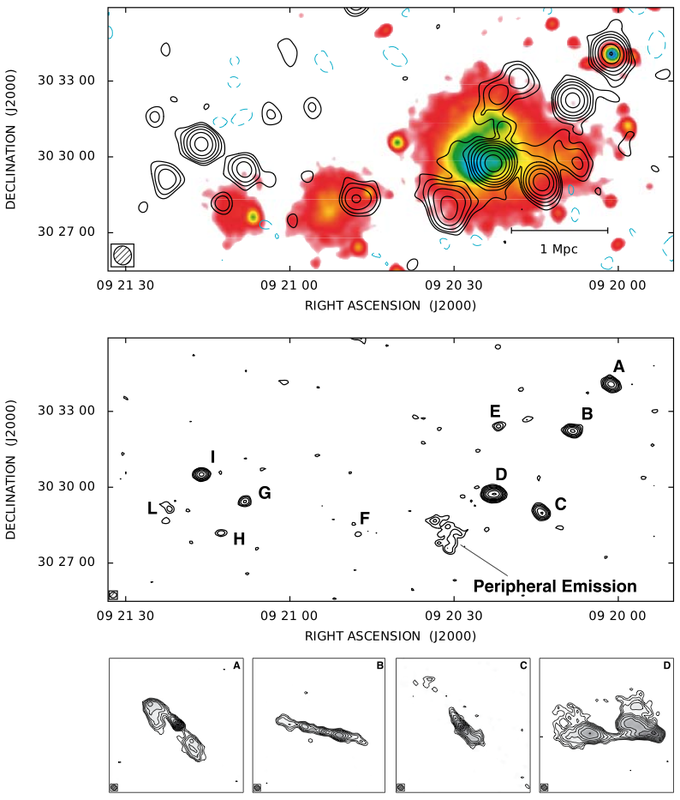 In addition to a number of extended radio galaxies, they noted a low surface brightness radio feature southeast of the Main cluster, with out a matching optical counterpart, which they referred to vaguely as "peripheral radio emission". Note however, that we find a couple potential DLS optical counterparts near the peak of the radio emission (compare image below with that of the Venturi et al. 2008 Figure 4 inset). Cassano et al. (2010) note A781 to be an outlier in their study which showed that radio halos appear to be associated with clusters undergoing mergers, while those without halos are usually more relaxed. They argue that it is surprising that A781 does not have a detectable radio halo despite being disturbed. This is contradicted by Govoni et al. (2011) who claim to find evidence for a radio halo, as well as suggest that the "peripheral radio emission" identified by Venturi et al. (2008) is a radio relic on the grounds of its radial steepening. Venturi et al. (2011) question the claim of a radio halo, arguing that it would require an unusually steep radio spectrum since they do not detect it in their 325 and 610 MHz observations. 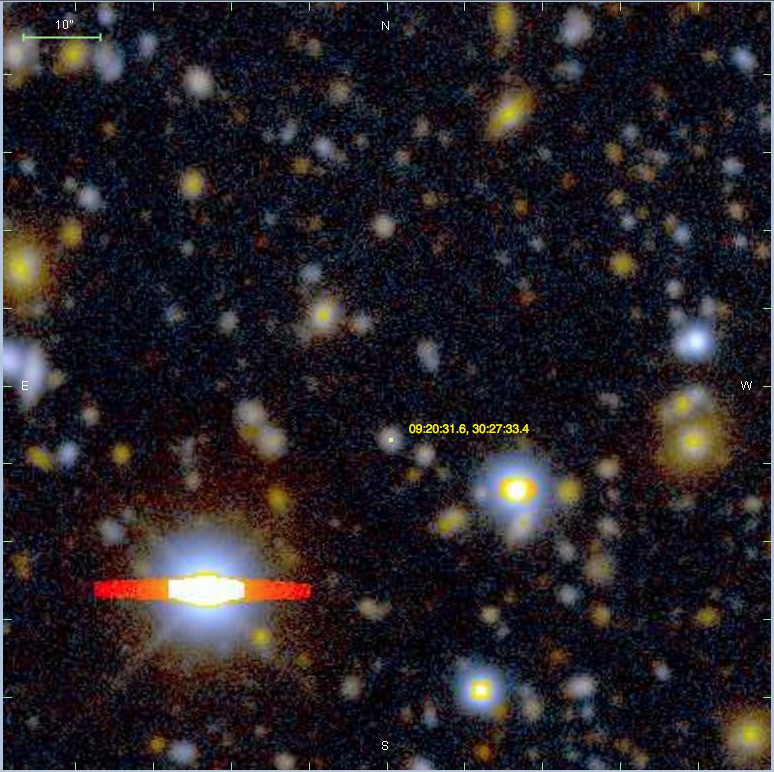 Based on XMM X-ray, DLS imaging / weak lensing, and VLA radio. **While there is HST coverage of the system it is not ideally pointed for cluster science (see image below). Abell, G.O., Corwin, H.G.J. & Olowin, R.P., 1989. 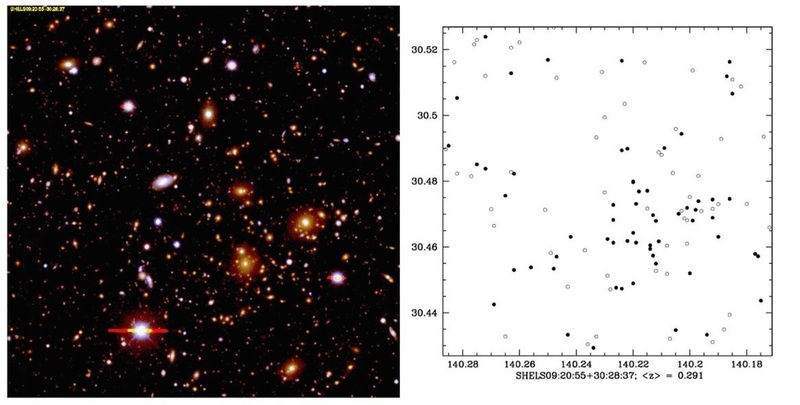 A catalog of rich clusters of galaxies. The Astrophysical Journal Supplement Series, 70, p.1. Geller, M.J. et al., 2005. SHELS: The Hectospec Lensing Survey. The Astrophysical Journal, 635(2), pp.L125–L128. Wittman, D. et al., 2006. 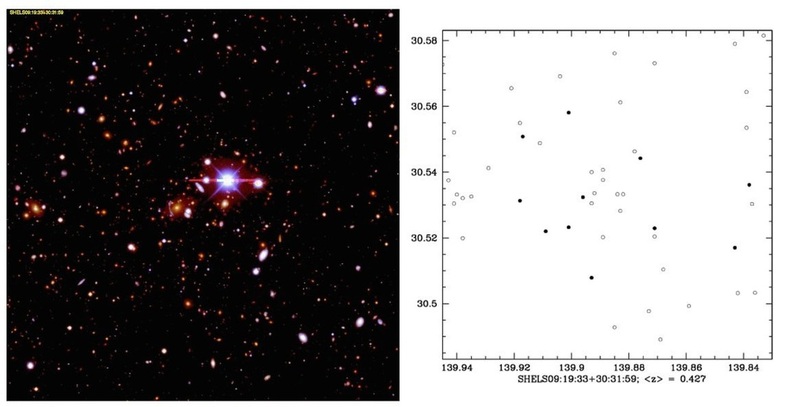 First Results on Shear-selected Clusters from the Deep Lens Survey: Optical Imaging, Spectroscopy, and X-Ray Follow-up. The Astrophysical Journal, 643(1), pp.128–143. Sehgal, N. et al., 2008. 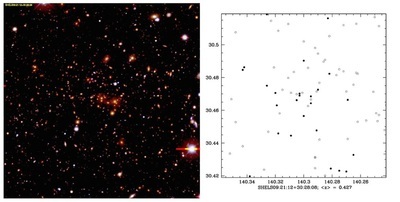 Probing the Relation Between X-Ray-Derived and Weak-Lensing-Derived Masses for Shear-Selected Galaxy Clusters. I. A781. The Astrophysical Journal, 673(1), pp.163–175. Venturi, T. et al., 2008. 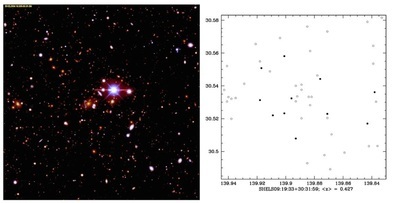 GMRT radio halo survey in galaxy clusters at z= 0.2–0.4. Astronomy and Astrophysics, 484(2), pp.327–340. Abate, A. et al., 2009. Shear-selected Clusters from the Deep Lens Survey. III. 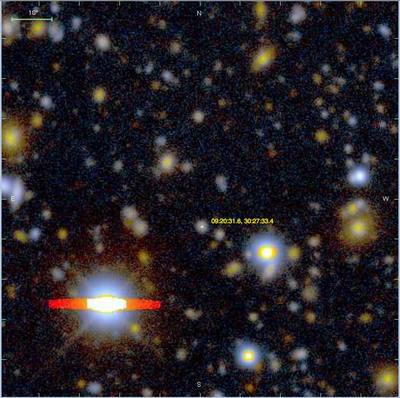 Masses from Weak Lensing. The Astrophysical Journal, 702(1), pp.603–613. Kubo, J.M. et al., 2009. 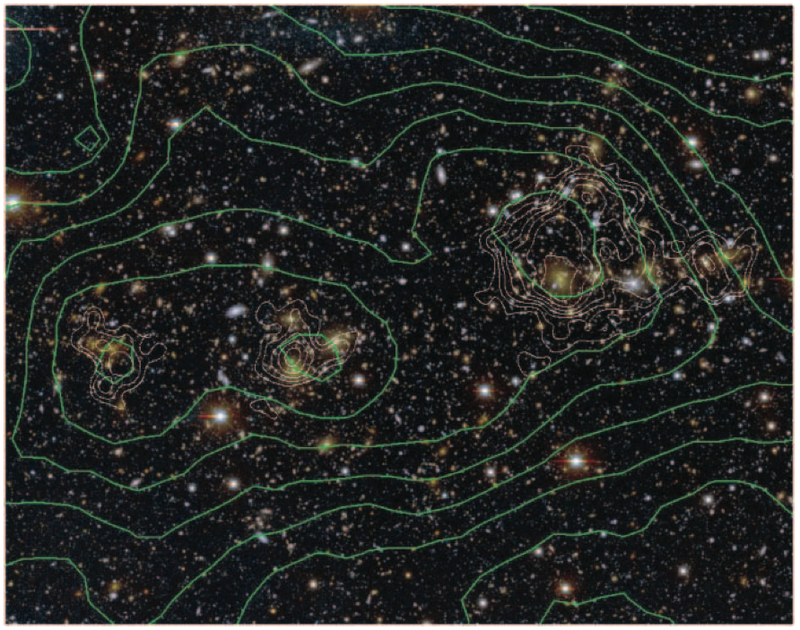 DARK MATTER STRUCTURES IN THE DEEP LENS SURVEY. The Astrophysical Journal, 702(2), pp.980–988. Geller, M.J. et al., 2010. SHELS: TESTING WEAK-LENSING MAPS WITH REDSHIFT SURVEYS. The Astrophysical Journal, 709(2), pp.832–850. Cassano, R. et al., 2010. ON THE CONNECTION BETWEEN GIANT RADIO HALOS AND CLUSTER MERGERS. The Astrophysical Journal, 721(2), pp.L82–L85. Govoni, F. et al., 2011. The large-scale diffuse radio emission in A781. Astronomy and Astrophysics, 529, p.A69. Venturi, T. et al., 2011. 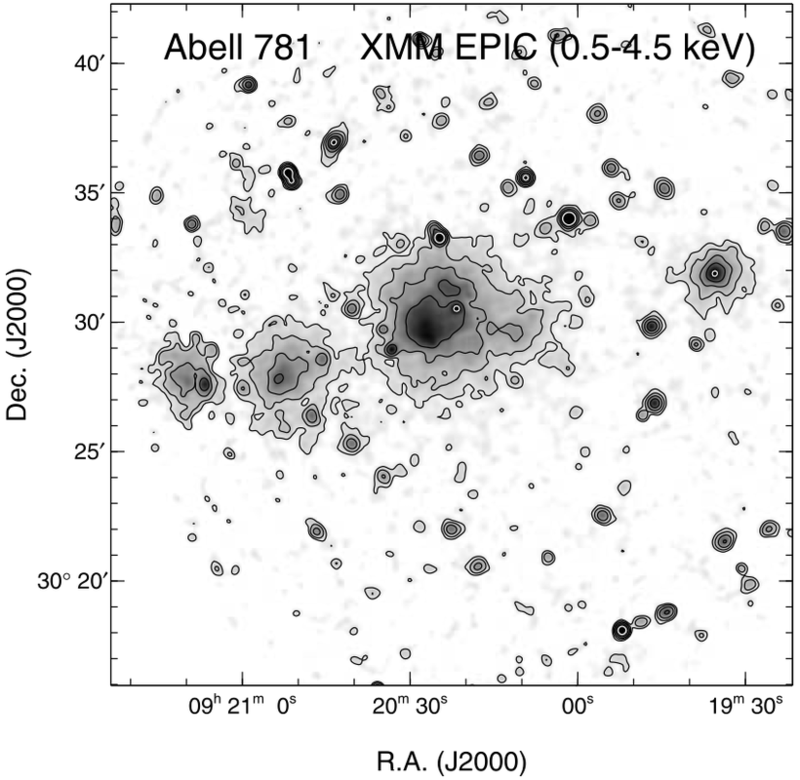 An elusive radio halo in the merging cluster Abell 781? Monthly Notices of the Royal Astronomical Society: Letters, 414(1), pp.L65–L69. Cook, R.I. & Dell'Antonio, I.P., 2012. THE MISSING WEAK LENSING MASS IN A781. The Astrophysical Journal, 750(2), p.153. Wittman, D., Dawson, W. & Benson, B., 2013. 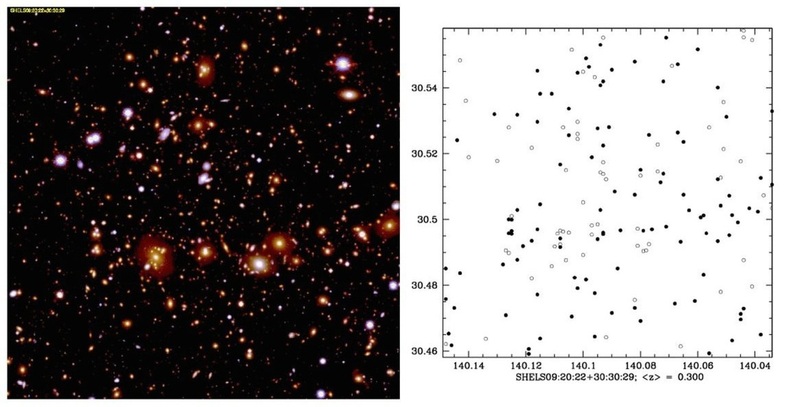 Shedding light on the matter of Abell 781. Monthly Notices of the Royal Astronomical Society, 437(4), pp.3578–3585.